A study led by Baojie Feng of the Hiroshima Synchrotron Radiation Center reports the discovery of two-dimensional Dirac nodal lines in monolayer Cu2Si. Monolayer Cu2Si is composed of a honeycomb lattice of copper atoms and a hexagonal lattice of Si atoms. Although this material has been synthesized decades ago, Feng and his collaborators improved the growth methods and synthesized high-quality samples. By using angle-resolved photoemission spectroscopy, they examined the electronic structures of Cu2Si monolayer in detail, and discovered two Dirac nodal lines. 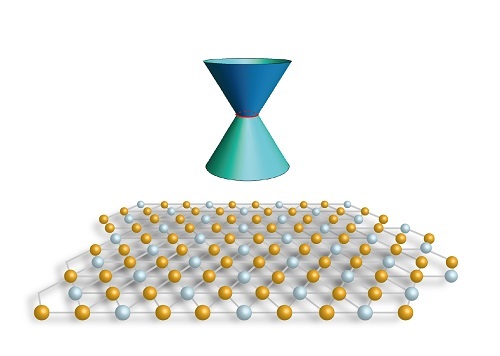 They have done extensive theoretical calculations and concluded that the crystalline symmetry in Cu2Si protects the two Dirac nodal lines against external perturbations, making it a promising material in designing high-speed quantum devices.